Gallery RIVAA, April 21st, 6:00 P.M.
Don't worry. There's no need to lock up your daughters or barricade the house. The poetry's real, the posse's myth and the walls are metaphorical. The only thing you have to fear is that Open Doors may awaken a fresh sense of what our community really is. Steven Willis, the artist who heads this show, has been featured on Huffington Post, for his "spoken word poetry," delivered in his first language, which identifies as "a more southern-fried English." And don't let his pose on the flyer fool you. Willis, in person, fluidly flashes a million dollar smile and has an irresistible boy-next-door charm. Hailing from Chicago, where his early work got crowds hopping at the largest teen festival in the world, Louder Than A Bomb, Willis unpacked his luggage here to try for an acting career. That got left behind when his success as a Mentor in Residence encouraged unheard, ready to be polished voices to speak up, open up and reach out. After working with a small group of Roosevelt Islanders eager to share their experiences and feelings through "spoken word" - as differentiated from "page" - poetry, Willis is prepared to lead them into their first public performance. In an American tradition established by Vachel Lindsay, best known for The Congo and the inventor of "singing poetry," the men Willis mentors will either read their own works or elect to have Willis, an established slam performer, bring vibrancy to them himself. But there is a broader purpose. "The event is also a chance to bring together different parts of the Roosevelt Island community and introduce people to the work of Open Doors," says Jennilie Brewster, the project's director. Open Doors is supported by the Angelica Patient Assistance Program. Beginning a 9-month training program at the New York Zen Center for Contemplative Care, Rivercross resident Brewster says, "I had to volunteer at a hospice or hospital, and I chose Coler because I wanted to get to know my neighbors." This led to her meeting "a group of younger residents, all men, who hung out in front of the building. Most of them were in wheelchairs." She soon learned they had a couple of problems, the immediate being a paucity of programs in which they could participate because Coler's were designed for an older population, its interests vastly different than these men, most of whom grew up in a generation that thrived on Hip Hop in urban, African American and Hispanic neighborhoods. But these men also suffer from an affliction that shouldn't exist at all and can be cured instantly. That is, Rony Lys, Tito Cruz and Vincent Pierce are long time Roosevelt Islanders burdened with community-induced invisibility. On a sunny, impossibly warm late afternoon in April, I sat along the waterfront with these poets in the making and talked about life, creativity and the future. For them, spoken word poetry is as simple as Hip Hop without music, rhythmic, chanted, raw and real. Writing it is what Pierce describes as "mind storming." For him, it's a way of "understanding life in a wheelchair," experiences with which most of us will never have to wrestle. "i can't tie my own shoes," Pierce says, asking me to envision how different his life is from mine. "I can't dress myself." "Every day, you have to adjust," pitches in Cruz. "You've got to be strong in your mind." The challenges these men integrate into their poetry must be viewed in terms of lives irrevocably changed, lives that once included ordinary things the rest of us take for granted. Lys, who was already writing page poetry before Brewster and Willis came along, shades a sly smile beneath a baseball cap. He moved here from Haiti when he was eleven but insists he is one-hundred percent New Yorker. One night, he did something he'd never done before. Hardly risky behavior, "I fell asleep in the back seat of a car." Five months later, he emerged out of a coma with no memory of a crash that wrecked his body, hooked up to tubes and braces and incredulous. "I fought it for three or four years," he reflects. Then, he had a dream, one in which he was walking as he always did in his neighborhood. "I was superman," he says proudly, but at the end of that walk, he dreamed of laying down flat on his back, looking up. He awakened to the identical, conscious condition. Message received. He began, like Cruz, to adjust every day. In 1992, Lys took up residence at Goldwater Hospital and remained there until its closing led to relocating at Coler. He likes Roosevelt Island and hopes to find an apartment of his own in one of the complexes. Like his friends, he needs advocacy to help discover what's available and how to apply. 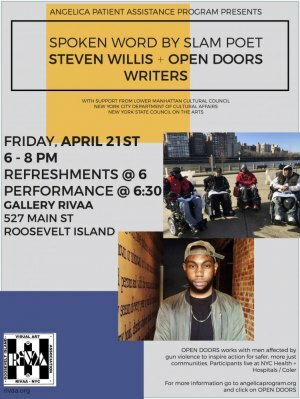 On April 21st at 6:00 p.m., Steven Willis leads his poetry posse into Gallery RIVAA, 527 Main Street. His widely honored work will be on display but, more important, so will the efforts of our talented neighbors. Your attendance goes a long way toward making Rony, Vincent, Tito and the others from their group visible as vibrant members of the Roosevelt Island community. You can learn more and register here on Facebook. Will you help make Roosevelt Island a better place for every one of us? See you there! 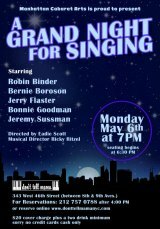 May 6th, Roosevelt Island's Bonnie Goodman in "A Grand Night for Singing"